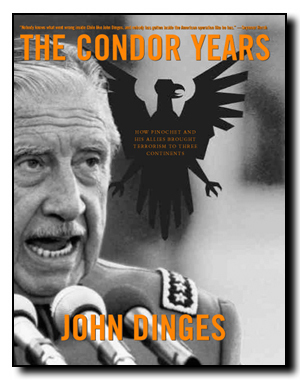 * Recommended Books John Dinges, The Condor Years: How Pinochet and His Allies Brought Terrorism to Three Continents (The New Press 2004/2005).Operación Cóndor: Una Década de Terrorismo Internacional en el Cono Sur (Ediciones B 2004/2005). ” Other translations: Os Anos do Condor: Una Década de terrorismo internacional no Cono Sul (Brazil: Companhia das Letras 2005); Les Années Condor: Comment Pinochet et ses alliés ont propagé le terrorisme sur trois continents (Paris: Editions La Découverte 2005, 2008).“Kissinger explained his opinion that the Government of Argentina had done an outstanding job in wiping out terrorist forces.” –State Department cable, 1978. For much of a decade, six allied military governments engaged in secret warfare intended to wipe out their enemies, kidnapping and murdering more than thousands of people in their own countries. At the initiative of Chilean dictator General Augusto Pinochet, they set up a multinational terrorist organization, Operation Condor, to pursue and murder the most prominent exile leaders who were organizing opposition the dictatorships from bases in other Latin American countries, Europe and the United States. The author, award-winning investigative journalist John Dinges, using newly available U.S. documents and the dictatorships’ own files, tells this gripping story from the point of view of those who have tried to keep it secret. He dispassionately lays bare the true extent of U.S. complicity in the crimes of the dictators, who called the United States “the leader” in what they called their anti-Marxist crusade. Revolutionaries, intelligence operatives, U.S. officials–many speaking for the first time–recount the brutal struggle between Condor and its enemies. Revelations in the book include the never before told story of U.S. intelligence lapses that detected, but failed to prevent an assassination by our anticommunist allies on Embassy Row in Washington, DC. Now, after decades of relentless pursuit, investigators and judges are using the international trail of Condor’s crimes to reverse the impunity the generals have enjoyed for so long, starting with Pinochet’s own arrest in London. The still-ongoing Condor prosecutions are changing international human rights law forever. Index terms: Operacion Condor, Chile, Argentina, Uruguay, Paraguay, Brazil, Brasil, Bolivia; Human Rights, torture, repression, CIA, Central Intelligence Agency, Junta Coordinadora Revolucionaria, MIR, ERP, Tupamaros, ELN, Che Guevara, Roberto Santucho, Henry Kissinger, DINA, Military intelligence, inteligencia militar, revolution, Salvador Allende, Stroessner, Hugo Banzer, Jorge Videla, Aparicio Mendez, Juan Jose Torres, SIDE, SID, SIE, Batallon 601, Robert Scherrer, Carlos Prats, Zelmar Michelini, Hector Gutierrez Ruiz, Michael Townley, FBI, Ed Koch, Orlando Letelier, PVP, OPR33, Bernardo Leighton, Baltasar Garzon, Baltazar, assassination, terrorism, war on terror, intelligence failure, Andres Pascal Allende, Edgardo Enriquez, Miguel Enriquez, Manuel Contreras Sepulveda, Jose Osvaldo Riveiro, Jorge Osvaldo Rawson. The Miami Herald: John Dinges lifts the lid on Operation Condor in this compelling and shocking account� As Dinges reveals, Condor was far more sinister than once thought. “As a secret treaty,” he says, “Condor elevated human rights crimes to the highest level of state policy, under the direct control and manipulation of the heads of state and ministers of government.” And he backs it up. Previous Article← DINA chief’s letter asks Pinochet for money to “neutralize” exile leaders. Letter is a false document, but request actually was made.